Hey everyone! Happy taco Tuesday! Today I’m bringing you easy, oven baked fish tacos. These are unreal. The sauce is the bomb dot com. The think I could honestly tip the entire batch of sauce on my head & pour it into my pie hole and call it a day. Seriously. But that would be waaaay inappropriate and then there would be none left for the tacos and that would be a shame. Now for these tilapia fish tacos, you’re gonna want a delicious sauce, right? Well this chipotle sauce recipe is really really good! Initially, I intended to make a chipotle mango sauce for this recipe, but when I started to peel the perfectly firm and ripe mango it was brown on the inside. Bummer. I guess that’s all you can do when you live on an island and much of the province’s food has to be shipped in from elsewhere. Now, it’s not what you may be thinking; it’s not an island like in the Caribbean or something where there are loads of white sandy beaches and turquoise blue oceans all romantical and stuff (yes, I made this word up and yes I do use it). Despite not living in the Caribbean, I really love where I live. We have lots of trees and obviously surrounded by water, but it can get cold. And I think we have like 2 weeks of warm summer weather, that’s if we’re lucky. What we don’t have in weather we make up for in beautiful scenery, a rich culture and unique food – jigg’s dinner, fish-n-brewis and toutons, just to name a few iconic Newfoundland recipes. All this and not to mention if you aren’t from here and you visit you can get ‘screeched in’ where there’s a whole process involving you kissing a cod. Yeap, pucker up, baby!! Don’t worry, it’s followed by a nice shot of screech (rum). Anywho, onto this easy chipotle sauce for those delicious fish tacos, am I right?? So to make this fish taco sauce you simply place all the ingredients in a food processor and blend until smooth. Nothing to it! For these tacos, tilapia was used because I like the texture and firmness of it. Feel free to use whatever white fish you have on hand or enjoy. Halibut or cod works lovely too. Make the sauce for tacos as spicy as you like. If you want more spice, add a little more chipotle or adobo sauce. If you like it less spicy, add less. Don’t have cornflake crumbs? Use panko bread crumbs! These oven baked fish tacos will still be crispy, golden and delicious! Love a little colour on tortillas? You can grill over your propane range flame or heat in a pan of a couple minutes, turning once. 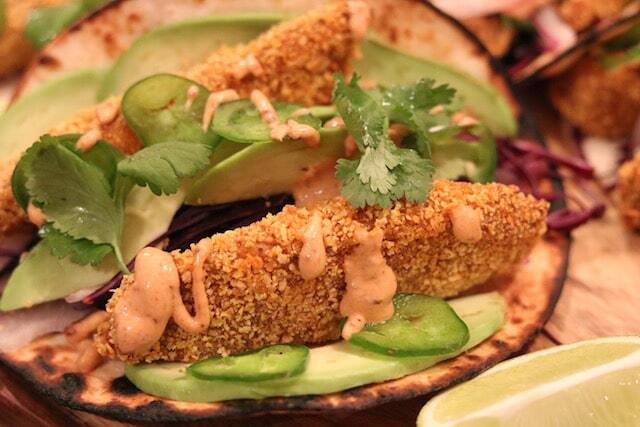 Hope you love these this easy fish taco recipe as much as I do! Until next time take care and chit chat again soon. These Oven Baked Fish Tacos with Smoky Chipotle Sauce are bursting with flavour. The fish has a nice crispy coating, there's lots of fresh toppings, like avocado, red cabbage and onion & it's all topped off with a spicy and smoky chipotle sauce. Combine all ingredients in a food processor and blend to combine. Preheat oven to 400F and place baking sheet in there to warm. Cut each fish fillet into about 6 pieces. Should have about 12 pieces in total, roughly. Combine cumin, cayenne, salt, pepper and chili power and dredge fish pieces into to coat. Beat eggs in a bowl and dredge spice coated fish pieces into. Shake off excess egg. Place corn flake crumbs on a plate and dip spiced fish pieces into. Press crumbs into fish. Carefully remove pan from oven and place coated fish pieces onto. Spray with PAM baking spray (optional). Bake for 10 minutes; turn fish pieces and bake for 2 minutes more. Remove from oven. While fish is cooking in oven, warm tortillas. If you have a gas range, carefully warm over the flame until charred slightly. Place tortilla over rolling pin so it will maintain a slightly curved shape when it cools. If you don't have a gas range, you can heat tortillas in a cast iron pan for a couple of minutes and then continue with rolling pin method. Alternatively, if you don't want to warm tortillas, you don't have to. To assemble tacos, place red cabbage on each tortilla, followed by some red onion, 2 fish pieces, more red onion, avocado, jalapeño, and cilantro. Drizzle with chipotle sauce. Serve immediately with lime wedges. Enjoy! -You can typically find chipotle peppers in adobo sauce where you would find tortillas, refried beans and salsa in your grocery store. They are usually in a small can. If you don't have chipotle peppers, you can use chipotle powder or smoked paprika (about 1 tsp, or to taste). If you don't have either of those, you can use cayenne pepper or sriracha hot sauce, but the sauce will be different. It won't have that smoky spice that you would get from chipotle or smoked paprika. -I used tilapia, but you can use your favourite white fish, like cod, haddock or halibut. I want to have these with a margarita or ice cold beer! That batter looks so crispy! I love chilies in adobo sauce-I started putting the extras I don’t use in a jar and freeze them whenever I want a little spice in my life. Thanks Smitha! I love fish tacos too! They’re awesome, aren’t they? So happy to have found your site. Living here in San Diego I eat many a fish taco and this one sounds right up my alley for sure. Methinks I’ll be make reading this blog a routine, love your writing, and from looking at the other commenters, I feel I am in good company. Thanks Dawn! Thanks so much, Kevin!! That’s very nice of you to say, appreciate it a lot 🙂 Hope you get a chance to try the recipe; I’d love to hear how you like them. Have a great weekend!! Taco night is of course a favorite around here and I’m partial to fish tacos myself! 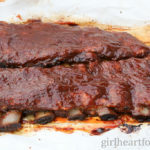 I love how you stepped it up a couple of notches with this smoky sauce – yum! (And good riddance mango – that happens to me, too, even not on an island… sometimes it makes way for better things!) Can’t wait to give these a try for a new twist on taco Tuesday! I’m partial to fish tacos too, Kathryn! So light so I don’t mind eating an extra one 😉 Hope you enjoy them as much as I do 🙂 Have a great week! What a perfect Taco Tuesday recipe! That sauce looks fabulous with or without mangoes! I want to hear more about this very interesting island! Thanks Rachelle! It is pretty interesting around here 🙂 Have a Happy Easter weekend!! These look amazing! Fish tacos totally remind me of summer, and I could really use that thinking today because it is really blah out there! Maybe I’ll whip up some of these fish tacos, set up my lawnchair in the living room, crank up the heat, and pretend it’s summer out! Oh yeah, and crack a nice cold beer to go with these as well of course 😉 .. Yikes only 2 weeks of summer weather, where are you? Sounds pretty though! Thanks for stopping by Serena! Appreciate the comments 🙂 That sounds like a great plan to me 😉 I know, we have a fair bit of rain in the Summer or fog or it’s not supper warm. Last Summer the weather was not great at all. That’s Newfoundland’s weather for ya!! Have a great weekend, girl! The chipotle sauce sounds delicious – what a lovely combination with the tacos and fish. Ok somebody has to rule that it has to be Taco Everyday 🙂 Fish tacos are our go-to dinner and I can literally eat it everyday for weeks and not get tired of it. This is certainly a must-try recipe. Pinned for later! Wait, screech, what?! Kissing fish? Too funny! That little story ALMOST distracted me from these tacos, but not quite, because these tacos and that SAUCE, oh my! They look amazing! True story! It’s almost too funny to be true, but it’s not 🙂 Happy you like the recipe, Liz! Have a lovely weekend!! The only thing better than loving where you live is tacos. True fact. 😉 These totally look bomb dot com, Lady!! Loving that you made these healthier by baking the fish, yet still keeping it crunchy! Yummmm! And any kind of chipotle sauce makes my tummy do a happy dance, mango or not! I’ll take two tacos for each hand please! Cheers, girlie! Haha! Thanks so much, Cheyanne 😉 Bonus – they’re healthier than fried fish so ya get to eat more, lol! Love me some chipotle sauce too; I could possibly use that stuff everyday. So happy you’re loving the recipe! Thanks so much for the lovely comments, as usual. Have a fantastic Easter weekend, friend!! Oh these tacos look so good! My husband and I love fish tacos, though I’ve never made them myself before. Sounds delicious with that chipotle sauce too. So perfect for Taco Tuesday (or any other day)! These look and sound amazing! I love chipotle anything and always have chipotle in adobo on hand 🙂 These are exactly my favorite kind of tacos, some flavorful fish, a spicy sauce and lots of fresh toppers… gorgeous! Haha Amanda! Sounds good to me! I’ve often eaten breakfast for supper, so why not eat supper for breakfast 🙂 ? I love fish tacos and making them in the oven is such a great idea! Yours look really yummy. Now about kissing those cod…. I agree, Kathy! Tons of flavour, but still good for you 🙂 Winner, right? Hahaha…I know, kissing the cod…so funny isn’t it? I Love all the photos! Beautiful post! I also hate when you cut open a perfect looking fruit to only find that it is all brown on the inside. …but, your sauce looks like it turned out amazing. I just bought some fish today and never thought of making them into tacos, but I think I am going to give this a try! Thanks so much, Amanda!! Appreciate it girl 🙂 Sounds like a great idea! Love to hear if you try the recipe and how you like!! Have a lovely weekend! 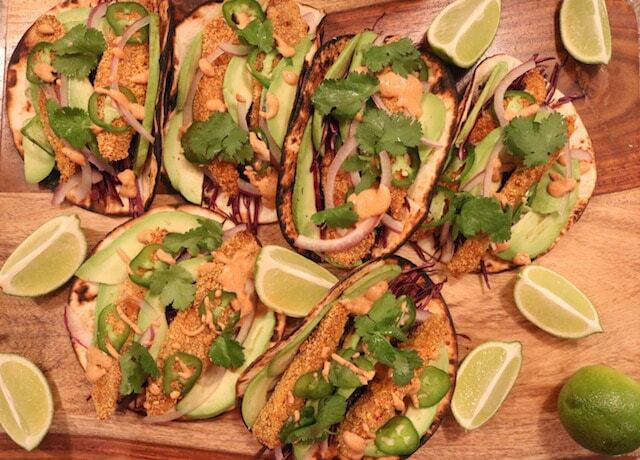 These fish tacos look absolutely delicious! Love the sauce! Hello taco Tuesday!!! These look fantastic and loving your chipotle sauce. My first week of Spring consisted of it snowing yesterday morning and it’s freezing today. Supposed to get up to high 50s this weekend so I think I’ll be okay. Making your fish tacos will cheer me up thou’. btw, don’t ever say “Beer is optional” again. You know better than that Dawn! lol! Thanks Karrie! It’s super cold here too. It was in the low 20s here today (about -5c) and about 50 miles per hour winds! Ugh. The end of February was actually warmer than what it is now. Hahaha!! I know what you mean! What was I even thinking saying beer is optional?! Total brain fart, lol!! Enjoy the tacos, girl!! Girl, these look amazing! I love that you used cornflakes on the fish. I used to make cornflake chicken and it makes the most amazing crispy coating. And that chipotle sauce!?! So good. Pinning! I hate it when mangos are brown: same with avocados! Why can’t they stay perfect until you need them… But damn, the crust on the fish looks incredible… Great recipe! Thanks so much Jennifer for stopping by and the kind comments 🙂 I know what you mean…I was craving them too and couldn’t stop thinking about them until I made some. Now I want to make them again next weekend, lol. Have a great week!